Three rivers—the MILWAUKEE RIVER, MENOMONEE RIVER, and the KINNICKINNIC RIVER—run through Milwaukee and converge DOWNTOWN. Because they forge connections across the natural barriers of rivers, bridges have facilitated transportation and commercial activity. But their construction and use also sparked conflict throughout the city’s history. Milwaukee pioneers SOLOMON JUNEAU, BYRON KILBOURN, and GEORGE WALKER competed fiercely to dominate the emerging city’s downtown business district. They staked claims along the Milwaukee River in hopes of directing the city’s growth. Juneau and Kilbourn purchased large parcels of land on opposite banks of the Milwaukee River, while Walker’s holdings were on a peninsula near its mouth. All three recognized that the flow of traffic on ROADS and bridges into their settlements had important implications for their economic development. Their intense rivalry remains visible in the pronounced angles at which certain downtown bridges span the Milwaukee River, a result of Kilbourn’s refusal to align streets on the river’s west bank with those on Juneau’s EAST SIDE. Commissioned by Kilbourn, Milwaukee’s first bridge (1836) spanned the Menomonee River near present-day Second Street. Its purpose was to divert traffic away from Juneau’s growing East Side. In 1840 the territorial legislature ordered a drawbridge constructed across the Milwaukee River near present-day Juneau Avenue. Kilbourn and other West Side partisans objected to the taxes levied for this project. Yet more bridges followed and sectional tensions increased, culminating in May 1845 in a series of conflicts. During Milwaukee’s “Bridge War” violent mobs destroyed three bridges. Reliable bridges supported community development throughout the region. Frustrated by years of flooding that washed out earlier bridges, in 1876 local farmers petitioned the TOWN OF CEDARBURG for a covered wooden bridge across Cedar Creek. Originally known as the Red Bridge, its outer planks protected its lattice truss frame (interlaced planks arranged diagonally) from weather damage. Since 1940 Ozaukee County has preserved the bridge. It was retired in 1962 and added to the National Register of Historic Places in 1973. It now serves as a pedestrian walkway and the centerpiece of Covered Bridge County Park. Historical markers commemorate it as Wisconsin’s last remaining nineteenth-century covered bridge. Bridges remained vital to Milwaukee’s commercial life at the turn of the twentieth century. By 1913 the city contained fifty-four bridges (including VIADUCTS), with sixteen across the Milwaukee River, fifteen across the Kinnickinnic River, and eight spanning the Menomonee River. While the city’s early bridges were wooden, they were replaced by new structures of steel, iron, and concrete built by local competitors the Wisconsin Bridge and Iron Works and the Milwaukee Bridge and Iron Works. 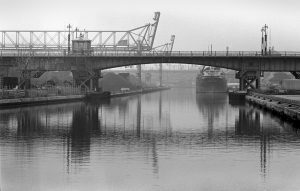 Milwaukee boasted different types of movable spans, including bascule, vertical lift, and swing bridges. A bascule bridge uses counterweights and a rotating mechanism to swing its span upward and provide clearance for traffic below. By repositioning the bridge’s operating mechanism, local engineers developed the innovative “Milwaukee Type Bascule.” This design lowered building and maintenance costs and became one of the most common styles of movable spans in the US in the period. Built in 1904, the earliest Milwaukee Type Bascule bridge crossed the Menomonee River at Muskego Avenue (now Emmber Lane). Thirteen subsequent bascule bridges built in Milwaukee before World War II replicated this design. Beginning in the 1960s, some of these were replaced by less costly vertical lift bridges (in which the span of the bridge remains parallel to the deck while rising vertically). 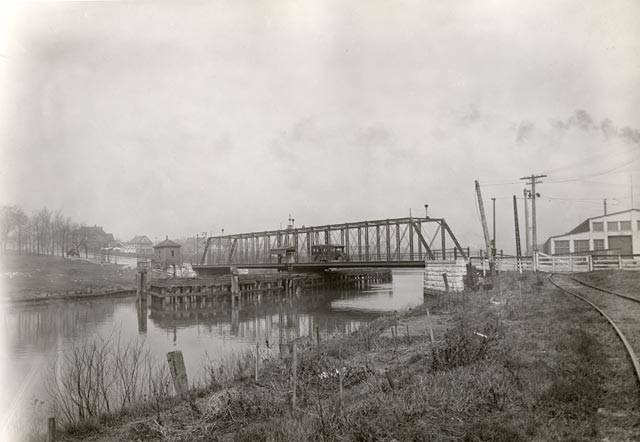 RAILROAD swing bridges constructed in the late nineteenth and early twentieth centuries reflected the growing commercial importance of trains. Because bascule bridges later replaced many of these structures, only a handful remain in Milwaukee (though most are retired or used infrequently). The most visible sits parked in the open position on the Milwaukee River adjacent to the HISTORIC THIRD WARD. One of the largest of its kind—weighing 800 tons, with a steel truss frame (consisting of interlocking triangles), and a 243-foot span—this bridge was constructed in 1915, replacing a smaller one built in 1890. At its peak in the 1920s, it carried 100 steam-powered trains daily. After the 1968 demolition of the lakefront depot that it served (located a mile north at the foot of Wisconsin Avenue), it was rarely used. Built in 1904, a double-track swing bridge spanning the Menomonee River (just west of the Milwaukee River) still operates, providing trains access to the Milwaukee Intermodal station. Because of their capacity to connect separated people, bridges again became the site of conflict beginning in the 1960s. In 1967-68, FATHER JAMES GROPPI and the NAACP Youth Council led CIVIL RIGHTS marches on the 16th Street viaduct across the Menomonee Valley to protest housing discrimination against African Americans. Renamed the James E. Groppi Unity Bridge in 1988, because of its symbolic importance, it has continued to host political demonstrations. In 2005, an interpretive sign about the struggle for open housing in Milwaukee was installed at its base along the HANK AARON State Trail. In the mid-1970s, the opening of the DANIEL WEBSTER HOAN Memorial Bridge was significantly delayed because of a bitter dispute over urban development. Also known as the Harbor Bridge, this massive structure spans the Milwaukee River inlet at JONES ISLAND and connects BAY VIEW to downtown Milwaukee via I-794. When work began in 1970, the bridge was part of a controversial network of FREEWAYS. It was completed in 1974, but organized opposition halted construction of its connecting highway segments. Closed to traffic for three years, it was known as Milwaukee’s “bridge to nowhere.” On- and off-ramps were added in 1977, finally connecting it to surface streets. Many aging bridges were rebuilt in the early 21st century. For example, the city’s first Milwaukee Type Bascule was replaced by a modern structure in 2000. One of the most impressive new structures was the Sixth Street VIADUCT (2002), which replaced a viaduct built in 1908. Spanning the MENOMONEE RIVER VALLEY, it contained two movable bascule bridges as well as two cable-stayed bridge decks (suspended by cables that fanned out from extended towers). In 2013, after years of noticeable deterioration (and fear of falling concrete), major renovations began on the Hoan Bridge with the goal of extending its life another half-century. John Gurda, The Making of Milwaukee (Milwaukee: Milwaukee County Historical Society, 2008), 26-38. Gurda, The Making of Milwaukee, 37. Bayrd Still, Milwaukee: The History of a City (Madison, WI: State Historical Society of Wisconsin, 1948), 22-23, 98-99; Gurda, The Making of Milwaukee, 35. Gurda, The Making of Milwaukee, 53; Still, Milwaukee, 39-40. Gurda, The Making of Milwaukee, 53. Gurda, The Making of Milwaukee, 52-57. “Cedar Creek Bridge Straightened,” Milwaukee Journal, November 25, 1988; “History of the Covered Bridge,” Ozaukee County website, accessed August 10, 2014; “Town History,” Town of Cedarburg website, accessed August 10, 2014; Early History of Ozaukee County, Wisconsin, 1965, “Covered Bridge,” 33-34e, University of Wisconsin Digital Collections, accessed August 10, 2014. Clipping, Henry Smith, “Milwaukee’s Bridges and Their Interesting History,” Milwaukee Daily News, November 1, 1913, Folder 5, Box 1, Henry Smith Papers, University of Wisconsin-Milwaukee Archives, University of Wisconsin-Milwaukee Libraries. Jeffrey A. Hess and Robert M. Frame III, Historic Highway Bridges in Wisconsin, vol. 3, Historical Survey of Wisconsin Movable Bridges (Wisconsin Department of Transportation, 1996), 36. Hess and Frame, Historic Highway Bridges in Wisconsin, 17, 41-45. Hess and Frame, Historic Highway Bridges in Wisconsin, 17, 43. “Milwaukee’s Historic Bascule Bridges,” Milwaukee Riverkeeper, accessed August 8, 2014; “Milwaukee Movable Bridges,” Bridgehunter, accessed August 8, 2014. Charlie House, “End of Line in Sight for Towering Depot,” Milwaukee Journal, February 2, 1968; Whitney Gould, “Milwaukee Needs Bridges to Its Past Too,” Milwaukee Journal Sentinel, October 25, 2004; City of Milwaukee Department of City Development, “Final Designation Study Report: Railroad Swing Bridge #1556, across the Milwaukee River at Jefferson Street,” (Milwaukee, 2005), 3, 6, 8, accessed July 18, 2014. John Marvig, “CP Menomonee River Swing Bridge,” John Marvig Railroad Bridge Photography, accessed August 9, 2014; “Hiawatha On Time Performance,” Amtrak, accessed August 9, 2014; “CP Menomonee River Swing Bridge,” Bridgehunter.com, accessed August 9, 2014. Patrick D. Jones, The Selma of the North: Civil Rights Insurgency in Milwaukee (Cambridge, MA: Harvard University Press, 2009), 170, 374; Gurda, The Making of Milwaukee, 374; “Key Terms,” The March on Milwaukee Civil Rights History Project, University of Wisconsin-Milwaukee Libraries, accessed July 21, 2004. “Key Terms,” The March on Milwaukee Civil Rights History Project, University of Wisconsin-Milwaukee Libraries, accessed July 21, 2004; Leonard Sykes, “Civil Rights Fighters Honored on State Trail: Father Groppi, Vel Phillips Given Interpretive Panels,” Milwaukee Journal Sentinel, August 12, 2005. Karen Slattery, “Community Members March across Bridge to Stop Violence,” Neighborhood News Service, Milwaukee, April 16, 2014, accessed July 21, 2014; Steve Schultze, “March, Rally in Milwaukee Seek Support for Public Education,” Milwaukee Journal Sentinel online, September 21, 2013, accessed July 21, 2014. Gurda, The Making of Milwaukee, 396-397; Ladley K. Pearson, “New Harbor Span Named After Ex-Mayor Hoan,” Milwaukee Sentinel, November 9, 1971; Max Raskin, “Daniel Hoan Deserved Honor of Having New Bridge Named After Him,” Milwaukee Journal, December 19, 1977; “Harbor Bridge Cited, but There’s a Catch,” Milwaukee Sentinel, July 21, 1975. “Milwaukee’s Historic Bascule Bridges,” Milwaukee Riverkeeper, accessed August 13, 2014. Jeff Sherman, “Impressive New 6th Street Viaduct Opens,” OnMilwaukee.com, accessed August 12, 201. Kevin Meagher, “Major Hoan Bridge Renovations Begin This Year,” BayViewCompass.com, May 1, 2013, accessed July 21, 2014; Jay Olstad, “Major Renovation Slated for Hoan Bridge,” News Radio 620 WTMJ, http://www.620wtmj.com/news/local/119123959.html, accessed July 21, 2014; Tom Held, “Hoan Bridge Report Says Falling Concrete Could Hurt Festival Patrons,” Milwaukee Journal Sentinel online, April 22, 2011, accessed July 21, 2014. Gurda, John. The Making of Milwaukee. Milwaukee: Milwaukee County Historical Society, 2008. Hass, Jeffrey A., and Robert M. Frame III. Historic Highway Bridges in Wisconsin. Vol. 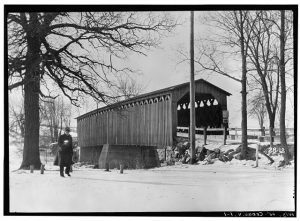 3, Historical Survey of Wisconsin Movable Bridges. Wisconsin Department of Transportation, 1996.